Definition and expansion drilling in progress with 46,000 metres from underground and 7,000 metres from surface planned in 2016. Lake Shore Gold Corp. (TSX:LSG) (NYSE MKT:LSG) ("Lake Shore Gold" or the "Company") today announced the completion of an initial National Instrument ("NI") 43-101 resource estimate for the Company's wholly owned 144 Gap Deposit ("144 Gap") located in Timmins, Ontario. The reported resource contains 301,700 contained ounces of gold ("Au") in the Indicated category and 319,200 ounces Au in the Inferred category as outlined below. The 144 Gap resource was estimated using the Inverse Distance to the power 2 (ID2) interpolation method with capping of gold assays evaluated by zone and ranging between 70 and 120 gpt, and an assumed long-term gold price of US$1,100 per ounce with an average exchange rate of $0.90 $US/$CAD. The cut-off grade for the base case is 2.6 gpt. 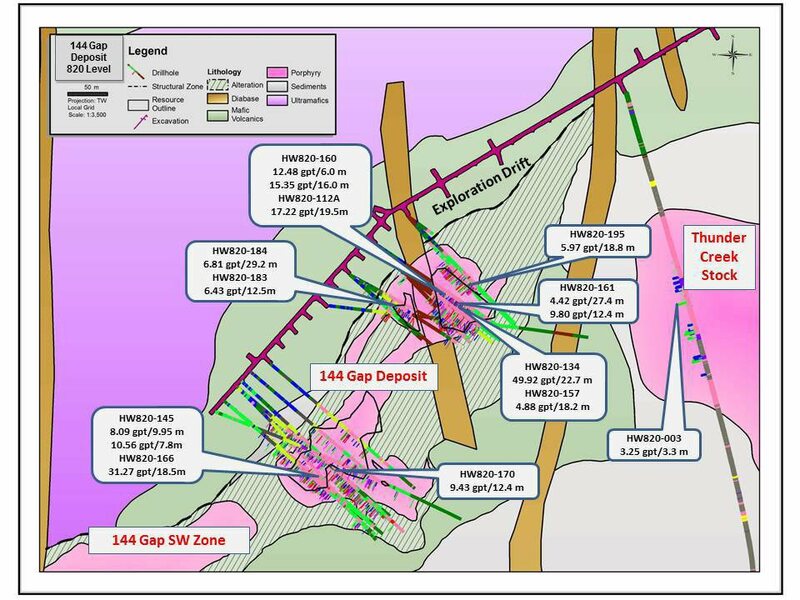 Tony Makuch, President and CEO of Lake Shore Gold, commented: "We are pleased with the initial resource at the 144 Gap, which is very much in line with our expectations and highlights the opportunity to significantly extend mine life at our Timmins West Complex through successful exploration along the 144 Trend. Today's results represent a first resource, with there being considerable potential to add to our resource base with further drilling. We have already achieved encouraging results from both surface and underground drilling at the 144 Gap since we closed the database to calculate the first resource. Additional holes being released today both confirm current estimates and identify opportunities to expand the known mineralization. The next steps are to begin development to support test stoping into the eastern portion of the 144 Gap. A total of 10,000 to 15,000 ounces of non-commercial production is targeted for the third and fourth quarters of 2016." The resource estimate was completed using a total of 291 holes of new drilling for a total of 176,332 metres. Of the new drilling, 146 holes (141,680 metres) were from surface drilling and 145 holes (34,652 metres) were from underground platforms established from the new exploration drift near the 820 Level. All recent drilling to define the resource was focused on a 400 metre strike length between 400 and 1,000 metres below surface. Typical drill spacing for the indicated resource is between 12.5 and 25.0 metres and for inferred resources less than 50 metres. The total resources reported are contained in nine separate zones lying between the 600 and 1,000 metre levels with the bulk of total ounces being hosted within the Main Zone and the East Zone. Average horizontal widths for these two zones are estimated at between 30 and 50 metres. A detailed review of estimated tonnages and grades by zone is presented in Table 3. While the two key zones cover a total vertical depth of approximately 400 metres, they are most concentrated in a 180 metre vertical interval between the 780 and the 940 metre levels. This interval contains 1,300,000 tonnes grading 6.00 gpt (253,000 ounces) in the Indicated category and 805,000 tonnes grading 5.72 gpt (148,000 ounces) in the Inferred category. Included within the mineral resource estimate is a sensitivity analysis from the base case cut-off grade of 2.6 gpt using various cut-off grades between 1.00 and 5.00 gpt. Grades are capped by zone at levels between 70 and 120 gpt. Sums may not add due to rounding. The base case resource estimate and sensitivity calculations were completed using a number of assumptions, including: an assumed minimum mining width of two metres; US$/C$ exchange rate of 0.90; mining, G&A and trucking costs of $74 per tonne; processing costs of $22 per tonne; and assumed metallurgical recoveries of 97%. Lake Shore Gold intends to file a Technical Report that is in compliance with the requirements of National Instrument 43-101 ("NI 43-101") within 45 days of the issue of this news release. Subsequent to the closure of the database for resource estimation, the Company has completed an additional 47 holes (10,134 metres) of drilling within and surrounding the new resource (see Table 4). The results from these holes generally confirm the original work and highlight new opportunities for resource expansion. Significant intersections obtained from new drilling within the resource models include 31.27 gpt/18.5 m from Hole HW-820-166 and 10.56 gpt/7.8 m from HW820-145 in the west portion of the deposit and 6.81 gpt/29.2 m from HW820-184, 5.41 gpt/36.0 m from HW820-186 and 49.92 gpt/22.7 m from HW820-134 in the east portion of the deposit. Significant intersections outside the resource include 6.43 gpt/12.5 m in HW820-183, 5.97 gpt/18.8 m from HW820-195, 9.43 gpt/12.4 m and 9.42 gpt/8.7 m from HW820-170 and 8.09 gpt/9.9 m in HW820-145. The intersections from HW820-183 and HW820-195 are located between 50 and 100 metres above the current outline for the East Zone and the intersections from HW820-170 and 820-145 are located on the immediate south edge of the Main Zone near the 820 Level. Mineral resources are reported inclusive of reserves. The Company's Overall Qualified Person ("QP") for the new NI 43-101 Technical Report is Eric A. Kallio, P.Geo., Senior Vice President of Exploration. Mr. Kallio is an employee of Lake Shore Gold and considered a Qualified Persons according to the definitions of NI 43-101. As a QP, he has prepared or supervised the preparation of the scientific or technical information and verified the data disclosed in this press release. Lake Shore Gold has implemented a quality-control program to ensure best practice in the sampling and analysis of the drill core. Assays have been completed using a standard fire assay with a 30-gram aliquot. For samples that return a value greater than 10 grams per tonne gold, the sample is fire assayed with a gravimetric finish. Select zones with visible gold are tested by pulp metallic analysis. NQ size surface drill core is saw cut and half the drill core is sampled in standard intervals. The remaining half of the core is stored in a secure location. BQ size underground drill core is either saw cut or whole core sampled. The drill core is transported in security sealed bags for preparation to the ALS Minerals analytical facility located in Val d'Or Quebec for fire assay. This ALS Minerals facility is registered ISO 9001-2008 (CERT-0051527) and is SCC ISO/IEC 17025:2005 Accredited (#689). Most underground drill core is analyzed by Activation Laboratories Ltd. (Actlabs) in Timmins, Ontario. Actlabs is an ISO/IEC 17025:2005 Accredited laboratory. Lake Shore Gold is a Canadian-based gold producer with operations based in the Timmins Gold Camp of Northern Ontario. The Company produces gold from two mines, Timmins West and Bell Creek, with material being delivered for processing to the Bell Creek Mill. In addition to current mining and milling operations, the Company also has a number of highly prospective projects and exploration targets, all located in and around the Timmins Camp. The Company's common shares trade on the TSX and NYSE MKT under the symbol LSG. True widths are not reported at this time. HW820-149, 155, 163, 165 and 190 returned week values <3.0 gpt/2.0 m or NSA.